This month is Special for these 2 Rollercoasters here in the UK. In Alton Towers 'Nemesis' is on it's 25th year since it was installed to the park. 'Shockwave' over at Drayton Manor in Tamworth, is also on its 25th year since being installed. In this special article we will go through some facts you didn't know about these rides. 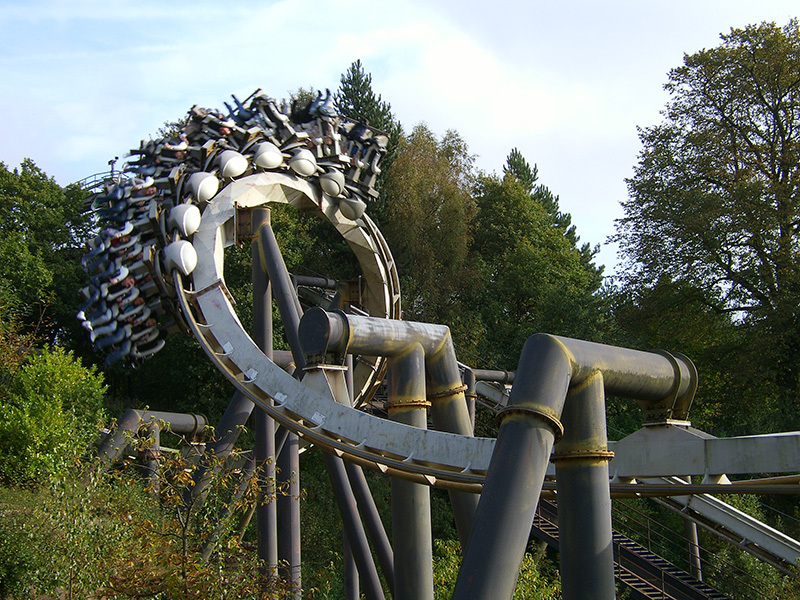 Nemesis was added to Alton towers in March 1994. It's an inverted Roller coaster built by B&M. It is located in the same area as 'Galactica', within the forbidden valley. The pic below locates Nemesis in Alton Towers on Google Maps. On the rollercoaster, you would experience 3.5G of Geforce and a top speed of 81 Kph or 50.3mph. The theme of Nemesis, was that there was that people found an alien creature under Alton Towers, but they got to it too late and it took over that section of the park. People that have ridden the ride say "It is intense if your riding it for the first time on the front row. If you're planning on riding it, try to sit 4 rows from the front row. But it's not so bad further back." The track spans 716m in length and goes through a tunnel. Originally this ride during construction was called SW3. On the start of their 2019 season Alton Towers Sung Happy Birthday to Nemesis before the first train full of riders got dispatched. 'Shockwave', originally named '7up Shockwave' was also opened in 1994. It was rebranded shortly after opening to become the ride we know today. This ride was the first Intimin Stand up coaster in Europe, to this date it's one of only two stand up coasters left in europe. The ride included a number of Inversions including a zero G roll. Located in Drayton Manor - Tamworth, 'Shockwave' is located directly next to Splash Canyon on the park . It's only one of 2 thrill roller coasters left on the park after G-Force, theirMaurer X-Car coaster, closed at the end of the 2018 season. People that have experienced this ride say "with this ride is amazing when I first went on the coaster i was on the back row and the zero G roll was amazing." We want to wish both roller coasters a happy 25th Birthday! Have you been on any of these roller coasters?